I have had lots of questions about publishing on other platforms besides Createspace. 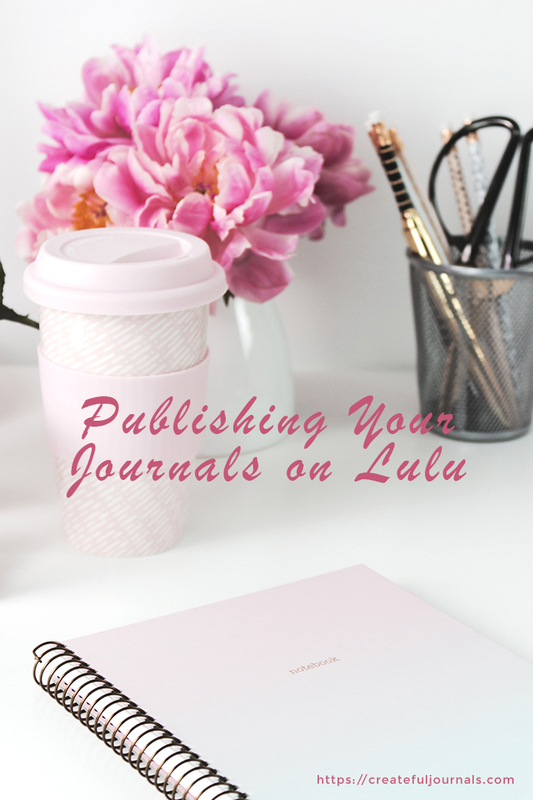 One that I love to use, especially for spiral bound journals and planners is Lulu. So I thought today I would share with you my thoughts and experiences about publishing on this site. Here’s a couple of my main reasons for using Lulu. They pay out royalties via PayPal with no minimum threshold – this is a huge benefit to those of us outside of the U.S. They offer spiral bound publishing at reasonable prices. They offer more than just book publishing – calendars and photo books are other options. You can have more than one account using the same PayPal email. They will send non spiral books to Barnes & Noble and the iTunes store. Color printing is pretty reasonable too. Your first step is to register a new account, you can do that here. That is my affiliate link, another nice feature, and if you sign up I get a commission fee and you get the first copy of your new book for free! When going through the set up process, be sure to get on to their newsletter list. They send out lots of coupons which are great for using for ordering proof copies of your journals and planners. When setting up your account remember that you will want to set up a new account for each Pen name, if you are using one. This is something I didn’t know about at first, and if I want to separate my current books will have to move them. 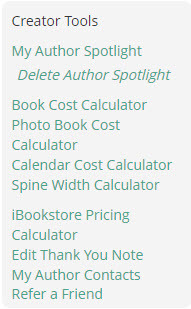 Lulu will automatically add all your published books to your Author Spotlight page. You can brand this page as you wish, and delete it if you don’t want to have an author page. This is a nice feature and is a good way to advertise your books at one time. You can also add videos and links to the page as well. The creator tools section has some nice features. This is where you will find the link to your Author Spotlight page and to the Refer a Friend section as well. You will also see the Edit Thank You Note section. This is great for using when you are Printing on Demand and shipping a book to a customer. I would use this for selling Spiral bound journals on Etsy, for example. Just customize the note and it will be sent with your order. The other helpful tools include the Calculators. Here you can determine the cost of your journals and planners before creating them. 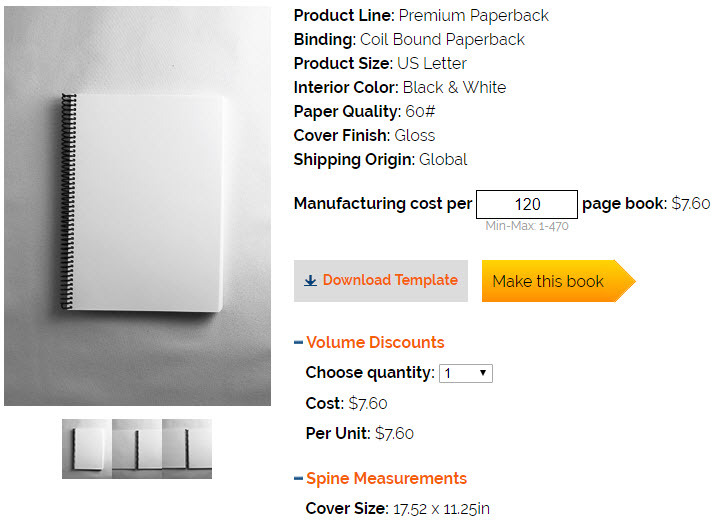 This way you can see what the different sizes would cost to publish, as well as the binding options. It’s also useful for helping decide what it would cost to print in color. The other calculator is the Spine Width calculator which is handy to help you create your PDF ecovers. Lulu has a new feature where you can design your covers using their Cover Creator. I still prefer to create my own PDF covers as they will be more customized. But using their creator is a good way to get started, especially if the covers are holding you back. The process of creating your journal is very simple and straight forward. I have found it to be much faster than uploading your files to Createspace, but that is a much larger marketplace for your books. After logging into your account you go to My Projects and click on the type of book you want to publish. I select the Premium Paperback section as this gives you higher quality paper and is where you will find the option for Spiral [coil] bound books. Select the size of the journal and the binding options. Not all sizes have the same bindings available, so play around and see what is available for your project. Once you have selected your size, added the number of pages you will see the cost of your journal and the cover specifications. You can then download a template to use or if you have your interior ready, then click on the Make this book to get started. Now you are ready to add your book. The next step is to name your book and add your author or pen name. Depending on the type of journal or planner you are creating, you will be shown your options for the different marketplaces. Plus you can just have your journal available to you only. This can be useful for custom orders or for creating family planners, calendars or photo books. If your planner was available with regular binding then you will have the options to sell on Barnes & Noble. On the next screen you will be asked to upload your PDF file. What I have noticed is that some fonts can cause issues so it’s best to stick to ones like Garamond for your copyright, title and back blurb if you are adding one. You can also upload your file in Microsoft Word Doc and Docx and TXT. If you happen to lose your place while uploading your documents Lulu saves your work so when you log back in you can just start again from where you left off. Another nice feature is that if you are publishing lots of journals with the same interior then once you have uploaded it once, you can use the Files On Lulu section for your next journal. This means that you are only adding the new covers each time. This makes the process faster as well. Once uploaded if there are any areas they will be displayed at the top of the page in Pink and Red. Fix any issues and then proceed by making your Files Print Ready. The next step is to create your cover. You can upload a PDF cover but one thing to note is that Lulu uses Postscripts for their sizes, but they do have the pixels in brackets now. Adjust your cover to ensure it’s the right size and then upload. The next sections are where you add your description and the price of your journal. Once you are happy with everything finish your project and your journal is now available. If you choose to order a proof be sure to check for coupons. I have always found a coupon on their home page or via being a subscriber to their newsletter. This can really help with the shipping costs as well. So that’s a quick overview of how easy it is to publish on Lulu. One of the major differences is that your journals area available immediately, there is no approval process as there is with Createspace. The one thing I wish that had was the Previewer so you can see what your journal looks like. What I have done is upload the book to Createspace and use the previewer before adding the files to Lulu. Or if you have published the book all ready, and just doing a spiral or coil bound version you know that they layout is good. If you would like more training on how to get your journals and planners published I have my signature course available now. It focuses on how to create journals by using PowerPoint templates and there is also a full section on publishing on Createspace and I will be adding video training of how to publish on Lulu as well. See my Signature Createful Journals Course Here. Hopefully that has helped and if you have any more questions just leave them in the comments below. You are my hero Sue! I’ve never gotten up the gumption to have a go at Lulu, since I relied on you to do it all for me, but now I think I might give it a spin. Seriously, you are one of the best (and nicest) people on the internet, so grateful I’ve know you all these many years! Thank you so much Helene. Actually now that you have mastered Createspace you will find Lulu much easier, and it’s faster to get published. There’s no approval process so once you have everything uploaded you are good to go. I love the fact that they have coupons which makes ordering a proof copy so much more affordable, especially for those of us outside the U.S.
can you publish on both the Lulu and createspace platforms? Just wondering. At any rate, thanks so much for sharing your expertise. It is greatly appreciated. Glad the post was helpful. I always publish on both platforms with the same book, I just either change the title a bit or the cover, usually the cover. 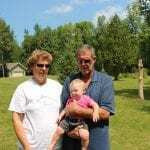 just wondering about isbn, can you use the same one on createspace and Lulu for the same book. 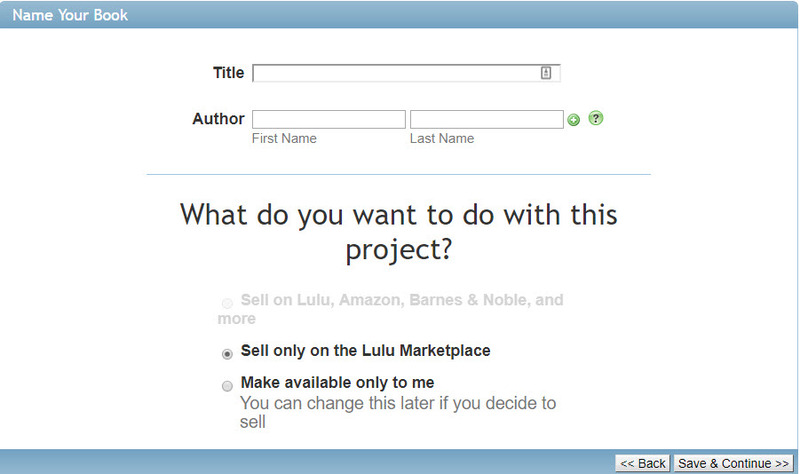 You would need two ISBN, but if you are publishing a spiral journal on Lulu then an ISBN is not necessary. They are free from both sites when needed. Just published my first book at Lulu and ordered a proof copy. What category do you normally choose for journals, planners etc? I usually select something as close as possible to the topic of the Journal. Thank you so much for this info. I’m seriously thinking of having my journals printed on demand by Lulu as I like their spiral bound option which Create Space (now KDP) don’t have. May I ask your opinion re. paper quality of the #60. People will be writing in these journals and if using pens does the writing show through to the back? Have you tried the heavier weight paper for journals and is it worth the extra fee in your opinion? Looking forward to hearing from you. I use Lulu most of the time for all of my spiral bound options. If you are just writing with a pen then their regular paper is fine, which is the #60. For coloring pages pens may bleed through but many publishers will leave a plain page on the back to help with this issue. I haven’t found any publishers that deliver to Canada with the heavier weight so can’t really comment on that at the moment.